Why can I only run until 20 weeks? Running is a high impact activity. It requires a tremendous amount of strength - core strength, hip strength, lower extremity strength, proper movement of your upper extremities. It is a continuous single leg stance and the faster you are, the more coordination is required. The patterns that are required for running are disturbed during pregnancy due to the growing baby putting pressure on your pelvic floor. Additionally, throughout pregnancy your body is producing a hormone called relaxin that causes your ligaments to relax so that your pelvis is able to open during delivery. This, however, puts you at increased risk for injuries and discomfort while running during pregnancy, leaving us exposed to problems such as pelvic organ prolapse, stress urinary incontinence, pubic symphysis pain, low back pain, hip pain and diastasis recti. If it is difficult for you to slow down and cut running out, we have created a Running Blog to tell you more. Walking is a great alternative for cardio, especially during pregnancy and postpartum because it is lower impact than running. Regardless of your experience level, all pregnant women should avoid any cardio activity that puts them at risk for a major collision or fall, such as horseback riding, skiing, biking and contact sports. Years ago, some experts recommended a heart rate of no more than 140 beats per minute when exercising during pregnancy. Today, however, heart rate limits are not the gold standard. Instead, the talk test is used as a guideline during cardio. You should be able to carry on a conversation when exercising while pregnant, meaning that you are able to speak a couple sentences without gasping for air while you are performing cardio. The image to the right is your perceived rate of exertion. You can use this if you don’t have a heart rate monitor. You should fall somewhere from 4-7- so your level of activity should still be moderate to vigorous but you should still be able to speak. Don’t just mindlessly jump on a machine or take a walk. Do it with INTENTION! Interval workouts are the perfect way to get your heart rate up! Interval workouts are when you push hard for a set time, then back it down, then go hard again. Below you can find some examples of interval workouts. Be sure every workout includes a warmup, cooldown and a few minutes of stretching before and after exercising. If you feel dizzy, short of breath or experience vaginal bleeding or pain of any kind, stop exercising immediately and call your doctor if the symptoms don’t go away. Performing a circuit workout at home can be done without any equipment. The following circuit is good prior to 23 weeks but is not diastasis recti safe. 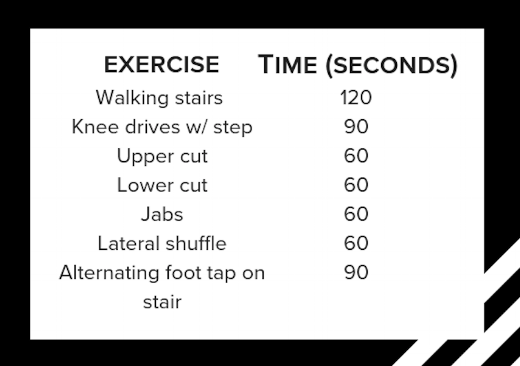 Perform each exercise vigorously for the time stated, rest for 20 seconds, then move on to the next one and repeat the circuit three times through. The following circuit is safe for anytime during pregnancy. Perform each exercise vigorously for the time stated, rest for 20 seconds, then move on to the next one and repeat the circuit three times through. The following circuit is safe for anytime during pregnancy. Perform each exercise vigorously for one minute, rest for 20 seconds, then move on to the next one and repeat the circuit three times through. You can do a killer workout with bands. They are such a simple way to add more resistance. There are so many different exercises you can do with them! Very easy to get it in a home or while traveling. This circuit is safe for anytime during pregnancy. Perform each exercise for the time stated (or 12-15x), and repeat the circuit 3-4 times through.